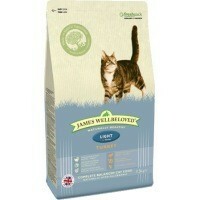 James Wellbeloved Adult Cat Light Fish & Rice Cat Food is an ideal diet for managing the weight of your adult cat. Made from high quality, natural ingredients in a hypo-allergenic formula, James Wellbeloved Light is excellent for the reduction of ingredient and nutrient intolerances. Omega 3 and 6 Fatty Acids - Promotes a healthy, glossy coat. Yucca Extract - Helps to reduce stool odour. Added Prebiotic - Encourages beneficial bacteria in the gut. Cranberry Extract - Beneficial to the urinary tract.